Prime SW location, Southern Exposure on sailboat access canal, minutes to the Gulf and near Cape Harbour. This beautiful home has 4 bedrooms, 2 baths, 2 car garage. Lounge in the electric heated pool and spa, year round. There is plenty of room to bring your sailboat and tie up to the large dock. The great room overlooks the beautiful pool area through large vanishing impact glass sliders. The kitchen features granite counters, stainless steel appliances, and a breakfast bar, as well as a breakfast nook that overlooks the pool area through the large glass windows. The large master suite has access to the pool deck through vanishing sliders, flat screen TV, as well as plenty of closet space. The master bath offers dual vanities, a separate water closet room, large walk-in shower with glass block window. Experience your perfect dream vacation in this beautiful villa with almost 250 sqm living area. The Flamingo Island is located directly at the Caloosahatchee River. The 3 bedroom and 3 bathroom house is beautiful furnished and has a very large and open living- dining- and kitchen area with high ceilings. The sunny pool area with large terrace and generous, heated swimming pool offers a magnificent view to the River. Enjoy the evening sunset with a drink on the terrace by the pool or, alternatively, on the separate barbecue terrace. Better can be a relaxing holiday not be! There is a large flat screen TV, WIFI throughout the house with fast internet connection and a stereo system with radio and CD player. In addition, there are all kinds, high quality kitchen equipment and machines (among others coffee machine, coffee grinder, toaster, blender, etc.) and dish washer, washer and dryer. 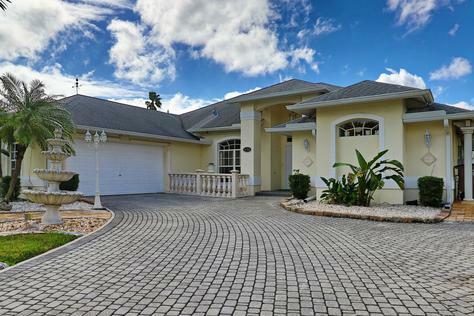 Enjoy the typical Florida lifestyle at this beautiful and well maintained Vacation villa. Modern and bright, fully air-conditioned rooms invite you to linger. High ceilings and 9ft. doorways convey a Generosity, which corresponds to the current trend of wide and open rooms.The formal dining room is separated from the Living area. Rounded corners outside and high pilars at the entrance, also bright, sun-flooded rooms with warm colors guarantees relaxing holidays right from the beginning. At approx. 1648 sq. feet of living area you will find three bedrooms beautifully furnished with comfortable interior, two bathrooms with tub and shower, and a fully equipped kitchen. A wide and comfortably furnished living area with entertainment center, and a separate Dining room. Kitchen fully equipped with dishwasher, oven and stove, microwave, toaster and coffee maker. Large fridge with a built-in ice-maker for ice-cold drinks want to make your stay even more comfortable. 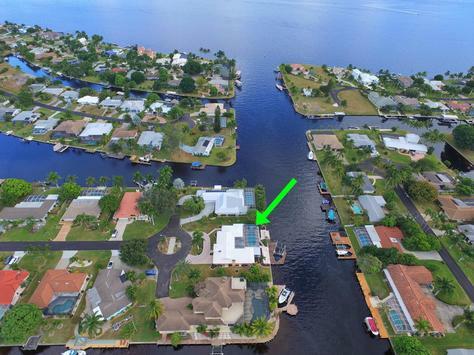 The warm and delighted vacation villa is located on a 1000 Square feet (0,25 acre) waterfront lot in the popular Southwest of Cape Coral. The house sits in southern direction, and points with its terrace and pool deck on a wide fresh water canal with access to several lakes. 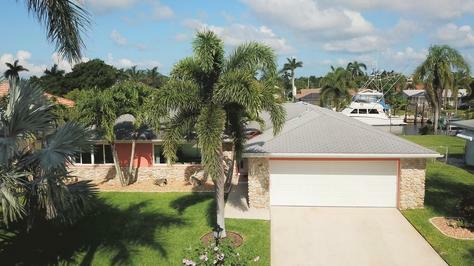 The villa is located on the beautiful Abaco Rose Garden of Cape Coral on a very wide canal and has a fantastic view. 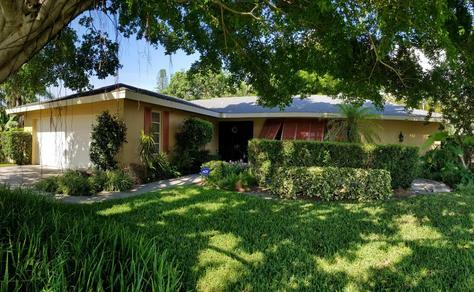 This large house is built on a corner lot and has oversized south facing position. 2015 has been completely remodeled and refurbished. A large boat Steeg and a boat lift access. 4 bedrooms and 2. 5 bathrooms with over 3000sqft has plenty of room for up to 8 people. 4 televisions in the bedrooms and the living area to disposal. The kitchen is fully furnished and has everything you need for cooking. The large pool and spa can be heated electrically. Shopping facilities and restaurants can be found nearby. 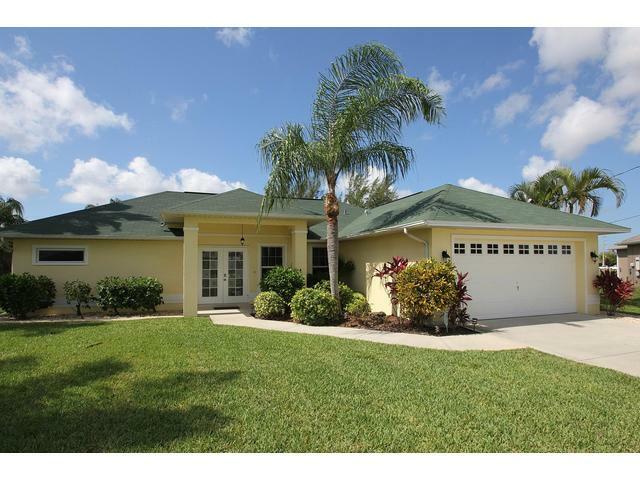 This wonderful house is located in one of the best areas in Cape Coral. The Villa Cosima has been completely renovated and newly furnished. This villa will fulfill all your holiday expectations. It is a very charming, quiet villa, perfect for sunny and relaxing vacation. It has 4 bedrooms and 3 bathrooms. A modern, very exclusive living area awaits you. From the kitchen and the diningroom you can see the sunny pooldeck with a very large pool. The boat dock is 40 m long and runs along the entire length of the property. Are you a boater? This place is only 2 minutes away from the river. **We charge $0.15/kwh for the used electricity. There are 4 spacious bedrooms, 3 bathrooms, a large kitchen, a very roomy living area, an eating area for 8 persons and separate seating area. The spacious terrace offers 150m² and the pool is larger than usual with 40m². From the terrace and garden there is direct access to one of the numerous canals. Directly at the canal there is a seating area with a firepit and a boat dock with boatlift. By boat it takes 15 minutes to the Caloosahatchee River and from there a further 10 minutes to the Golf of Mexico. 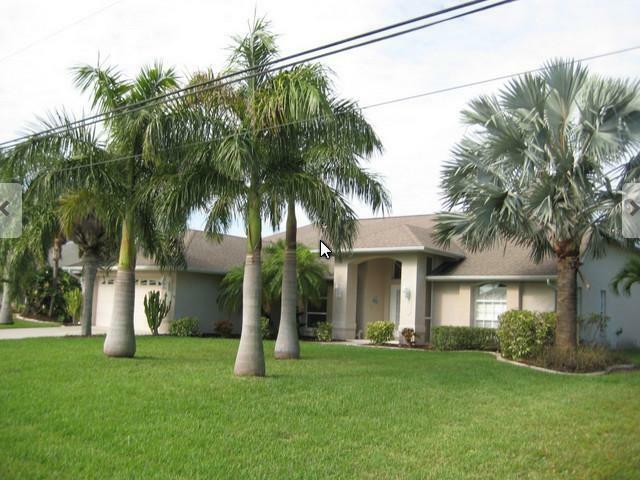 The nice villa was built in one of the nicest areas of Cape Coral. It was built for over the typical standard and is thought for people that have kept the sense for the most beautiful things and for the ones who appreciate the luxury.…..and to make the nights as beautiful as the days, we have 7 bedrooms and 7 bathrooms, furnitured with a lot of love and flavor. And every room´s got different furnitures. Walk in closets take your vacation bags comfortable and you can als decide the temperature in every room with a ceiling ventilator and a clima system. We wish you a nice even know a good night in the “CASA GRANDE”. 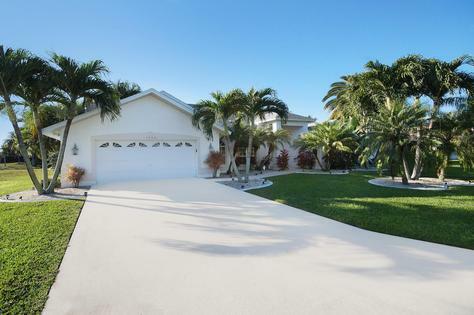 This exceptional villa was built in one of the nicest areas of Cape Coral. It was built for over the typical standard and is thought for people that have kept the sense for the most beautiful things and for the ones who appreciate the special.…..and to make the nights as beautiful as the days, we have 4 dorm rooms, furnitured with a lot of love and flavor. And every room´s got different furnitures. King size beds are in the masterbedroom 1 and in the masterbedroom 2. The two guest rooms are provided with a queensize bed and 2 twins. We wish you a nice even know a good night in the “Villa Grandiosa”. There is a 5th bedroom (kingsize bed) with it´s own bathroom. The bedroom is optional and can be booked for $40.00 extra per day plus an extra cleaning fee of $30.00. Villa Harriet is on a south facing canal lot with beautiful views and a large saltwater pool. There are 2 one- and 1 two-person kayak, a pool table, super fast internet, a computer that can be used throughout the house with a laser printer. In the Livingroom there is a 70" 4K TV, in the two masterbedrooms and in the lanai there are 48" 4K TVs and in one of the smaller rooms there is a Full HD TV. Music can be streamed in both the lanai and the livingroom, and photos can be shared via AppleTV. Due to the absolute southern exposure can be eaten pleasant at any time. There is a gas grill and plenty of dishes. In the laundry, a washing machine and a dryer are available. Travertine was chosen as flooring throughout the house and in the lanai. 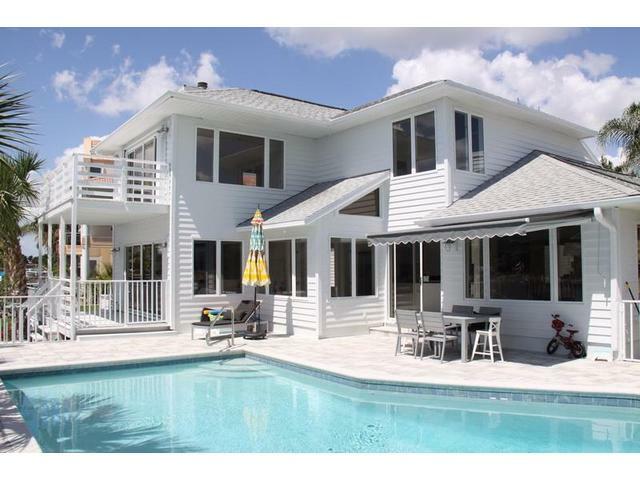 Villa Lady Mary is very centrally located, within walking distance to restaurants & shopping centers, a popular yacht club with its beautiful white sand beach, but also to Fort Myers, Fort Myers Beach & Sanibel Iceland with its magnificent dream world famous beaches. 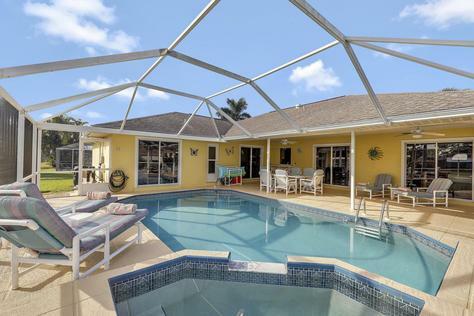 In a small road on a traffic free residential area has all the rest to recover from the stress of everyday life and to be pampered by the Florida sun on the large pool deck. The pool is electrically u. Solar heated, which swimming fun for the whole year. 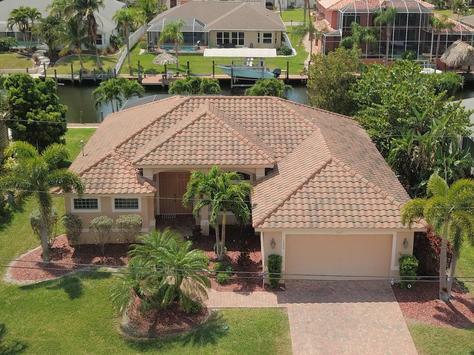 The Villa Paradiso is situated in one of the finest and most exclusive residential areas in southwest Cape Coral, directly on a beautiful and wide saltwater canal with private boat dock. From here you can reach the Gulf of Mexico in about 20 minutes. 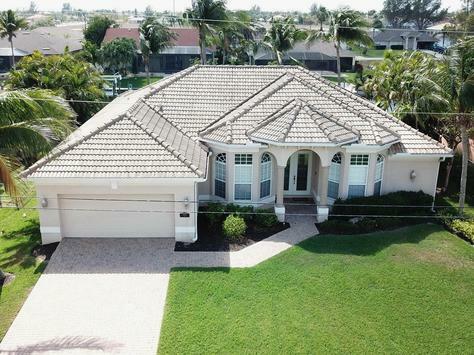 The Villa Paradiso is just a few minutes from the marinas Cape Harbour, Tarpon Point and the beautiful sandy beaches of Cape Coral and Fort Myers Beach. The house is very high standard and is also used by the owner. It therefore offers all the comforts for occupancy of up to 6 people. The large heated pool and very large terrace is ideal for swimming and relaxing. During their stay the guests free internet (wireless) and a navigation system are available. This beautiful home has 3 bedrooms, 3 baths, 2 car garage. Lounge in the electric heated pool, year round. There is plenty of room to bring your boat and tie up to the large dock. The great room overlooks the beautiful pool area through large vanishing impact glass sliders. The kitchen features granite counters, stainless steel appliances, and a breakfast bar, as well as a breakfast nook that overlooks the pool area through the large glass windows. The large master suite has access to the pool deck through vanishing sliders, flat screen TV, as well as plenty of closet space. The master bath offers dual vanities, a separate water closet room, large walk-in shower with glass block window. 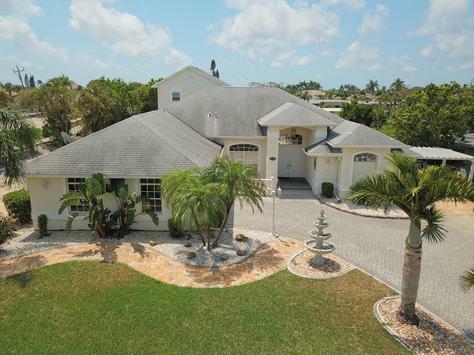 This beautiful villa imbeded in a lush garden with palm trees, hibiscus and bougainvillea in Southwest Cape Coral is located on the Baruna Canal with direct Gulf access. The spacious pool area consists of a partly roofed terrace and a solar heated salt water pool. A cage protects you from unsolicited guests. You will be acommodated in 3 bright bedrooms, 2 baths, an inviting living area with fully equipped high quality kitchen and a dining area. An individually adjustable room air conditioner will provide a comfortable indoor climate. Enjoy the evening with a delicious BBQ on the gas grill. Paradise Found! Adorable sailboat access home with 3 bedrooms, 2 bathrooms and large Florida Room with walls of windows that slide open to take advantage of the gorgeous fall and winter weather and views of the lushly landscaped backyard, 3 sets of sliding doors open onto the Florida Room giving this home a large open feel. Mature palm and fruit trees are all part of the appeal of this home. Thats the perfect home for relaxing and chilling. 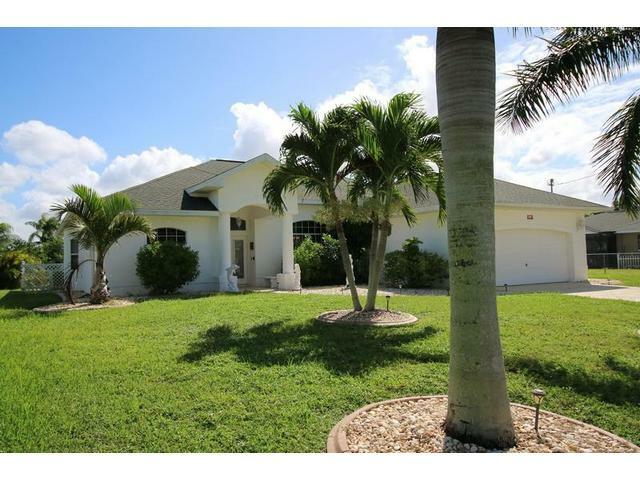 This wonderful house is located in one of the best areas in the south of Cape Coral. The house is built in u-shape around the electric heated pool. To completely relax you can use the big real jacuzzi. This villa will fulfill all your holiday expectations. It is a very charming, quiet villa, perfect for sunny and relaxing vacation. It has 3 bedrooms and 3 bathrooms. A modern, very nice living area awaits you. From the kitchen you can see the sunny pooldeck with a very large pool. Are you a boater? We have our own boat dock and this place is only 5 minutes away from the river. 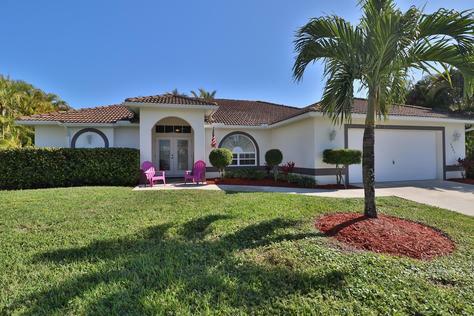 Spend your dream vacation at Villa Flamingo, our beautiful and comfortable vacation villa in Cape Coral, South West Florida. The villa offers you every comfort on almost 2000 square feetof living space and over 1000 square feet pool area, with large electric and solar heated pool.The villa is located in absolute quiet east facing, with sunshine on the pool area already for breakfast. The villa has 3 bedrooms and 2 bathrooms, 2 living areas, dining area and a fully equipped kitchen. Ideal for 2 to 6 people to enjoy your vacation. Whether you stay in the villa exclusively with only two people, or with the family and/or friends up to six people, this house offers you enough space and amenities due to the spacious construction. Villa Flamingo is surrounded by palm trees and tropical plants. 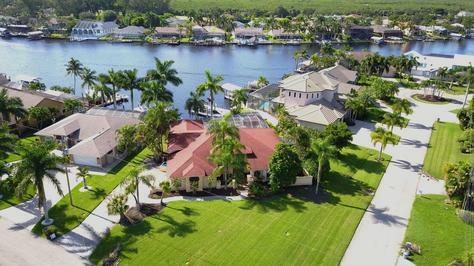 The house is located directly on a saltwater canal. With the boat belonging to the house, you reach after a short drive, the most species-rich waters of the earth, the Gulf of Mexico, with its unique island world. Like Sanibel or Captiva Island.